MANILA, Philippines - The created noontime show performance of the group dubbed as Team TBJ (Teddy, Billy and Jugs) earned the title of "Magpasikat Week" 2014 grand winner on Saturday, October 25 after Big Brother announced the results from the judges to cap off the 5th Anniversary Week of "It's Showtime." 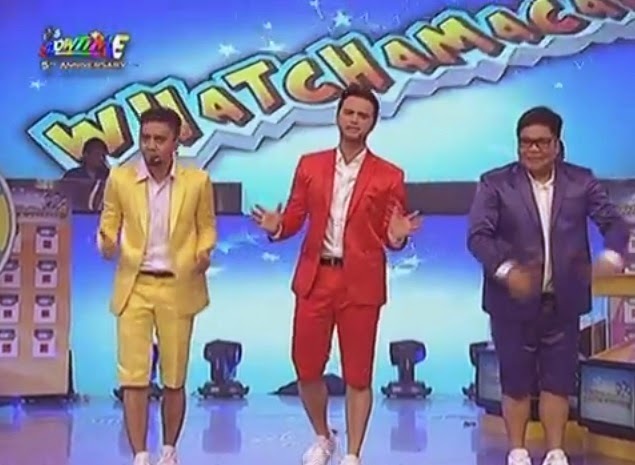 "Team TBJ" unlike their co-hosts who took the stage with sing or dance performances earlier this week, debuted their own game show called "Whatchamacall8." It was presented as its own noontime program, complete with colorful props, energetic dancers, and mock TV commercials featuring Crawford, Jugueta and Corpuz. As the Magpasikat Week champions, Billy, Teddy and Jugs won P300,000 for their chosen charity. Placing second and third were the duo of Vhong Navarro and Jhong Hilario and Team Anne and Coleen, taking home P200,000 and P100,000 for their chosen charity, respectively. The two remaining teams -- the tandems of Vice Ganda and Ryan Bang, and Karylle and Kuya Kim -- received Php 50,000 consolation prizes for their chosen charities. Sitting as judges for the week are actress Cherie Gil, and singers Jim Paredes and Pops Fernandez. 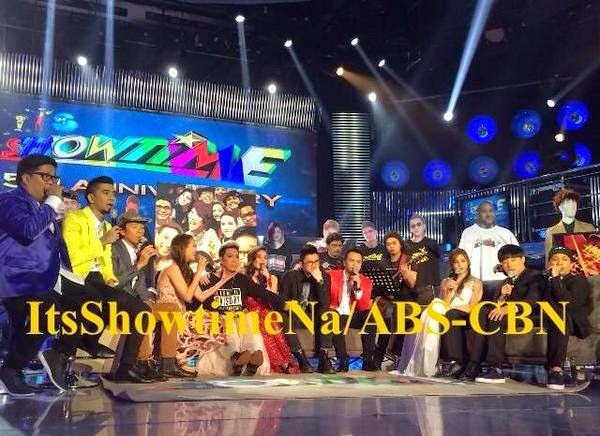 On Saturday, the noontime show has showcased Pinoy talents as some winners and finalists of various competition have performed in the Showtime stage. It includes Inter-Town Grand Finalist Lahing-Anda of Pangasinan, Inter-Town Grand Winner La Castellana Bailes de Luces, Pinoy Halo-Halo grand winner Francis Ryan Lim, Pinoy Halo-Halo first runner-up Seongki Min, MiniMe contestants Telesa Marie de Torres, Margarette Mitch Naco and Nhikzy Vheench Calma, Kalokalaike Face contestants Reginald Abrio (apl.de.ap) and Michael Angelo Ernesto Lasag (Mr. Bean), Hip hop dance crew XB Gensan, Bida Kapamilya celebrity winner Regine Tolentino and Kapamilya. "The Voice of the Philippines" grand winners Mitoy Yonting of Season 1 and Lyca Gairanod of Kids Edition also performed and have belted out Aegis hit 'Halik'.